Re-submit the entire announcement, then contact the NYE Calendar Editor to request deletion of unwanted items. .. View the Non NYE Holiday Events ..
Dance to Smooth, Latin and Swing Music. Ring in 2018 with us. hats & noise makers, sparkling cider, champagne toast at midnight. DC Hand Dance Club invites everyone to a New Year's Eve Party held at the Double Tree by Hilton Baltimore, BWI airport, 890 Elkridge Landing Rd, Linthicum, MD on December 31, 2018 from 5 pm - 1 am. Registration forms and information can be found at the link provided, the forms can be downloaded and sent to the address on the form. Please register by December 17, 2018! Club members cost $80, non-members cost $90. 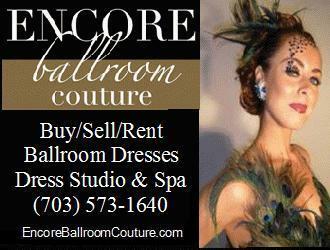 Special room rates at the Double Tree $95.We are a fun group and welcome everyone to come dance with us! NYE Gala with the Gettysburg Big Band Orchestra! New Year's Eve rocks to a mix of live Ballroom, Swing and Latin music provided by the Gettysburg Big Band Orchestra and filled in with DJ "V" during the breaks in the Grand Terrace Ballroom of the Heritage Hills Hotel. Noise makers, Champagne or Sparkling Grape Juice at midnight and dancing till 12:30am +. Non stop toe tapping night of dance with a full course sit down dinner. Assortment of cheesecakes. Doors open at 7:00pm. Dinner is served at 7:30pm. Band Starts at 9:00pm. Cost: $76.50 per person for dinner, dance, and Champagne Toast ($78.50 with PayPal). 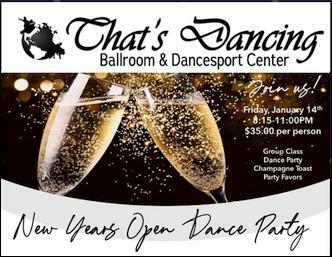 Dance Only: (arrive at 9:00pm) $36.00 per person. Dress is Black Tie Optional. Contact Vera Kywa at 717 751-2475 or verakywa@2Danc.com for reservations or more information. Location: The Heritage Hills Resort and Conference Center, 2700 Mt. Rose Avenue, York, PA 17402. For overnight accommodations contact the Heritage Hills Hotel at 717 755-0123 and ask for Vera Kywa's New Year's Eve Gala rate. For a less expensive over night stay option consider the Courtyard by Marriott, 2799 Concord Rd., York, PA 17402 at 717.840.7840. New Year's Eve at the Mobtown Ballroom is Baltimore's best party. all around crazy shenanigans. Free champagne toast at midnight. This event sells out every year, so get your tickets while they last. Dress to impress. It's New Year's Eve. Enjoy the ultimate New Year's Eve experience in style! It's Antrim 1844's most anticipated event, filled with every luxurious detail imaginable! Hand-passed hors d’oeuvres and a sumptuous seafood display. Seated for dinner an unforgettable seven-course dining experience prepared by our Executive Chef. Then heralding in the New Year with Antrim’s famous Scottish bagpiper performing Auld Lang Syne. Turquoise & Teal are our theme colors this year! $45 til the 28th and $55pp the 28th and on. Dress in your favorite movie character costume OR dress to impress for a night on the Red Carpet! Discount Hotel Rooms Weekend package available at huge discount. Special Discounts for Groups: Save $9-$10 per ticket! 6–12pm Celebrate NYE in Style. The Best Top DJs Salsa, Bachata, Kizomba, Zouk, Top 40, Hip-Hop, House mash-ups. 8:00~ 1:00am, $40 Adv ~ $45 Door. Join us for a wonderful evening of food, fun and dancing! Music for ballroom, Latin, swing, tango, hustle, night club 2-step, country western and more. Featuring:Joe Battaglia and The New York Big Band. 8:00 pm – 2:00 am. VIP Seating (starts at 8:00PM) includes: 4-Course dinner with dancing, open bar, champagne toast, and live music until 2:00AM. Mezzanine Seating (starts at 8:00PM) includes: 4-course dinner with dancing, open bar, champagne toast, and live music until 2:00AM. Welcome 2019 with music and dancing at our Grand Foyer Party, one of D.C.'s most popular annual traditions! also at 10:15 p.m. (*tickets required) as part of the Grand Foyer Party. as part of the Grand Foyer Party. Admission is included with any ticket purchase of a performance at the Kennedy Center on Monday, December 31, 2018. Montgomery county, off Rt. 29, minutes from 495, the ICC and I-95. DJ Pacman Productions "Rudy Merc"
Dinner, Dancing & Party Favors for All Guests. Doors open at 7:30 pm. $15 at the door. Please bring an appetizer of dessert to share. New Year's Eve Midnight Brunch Dance Party! Rock out & ring in the new year with live music, cocktails, and dancing. Enjoy live music from Kanye Twitty and stay for a champagne toast at midnight! Includes party favors & continental breakfast. Doors open at 7pm and the party doesn't stop until 1:30am! 21+ only. Cover Charge: $25 per person. 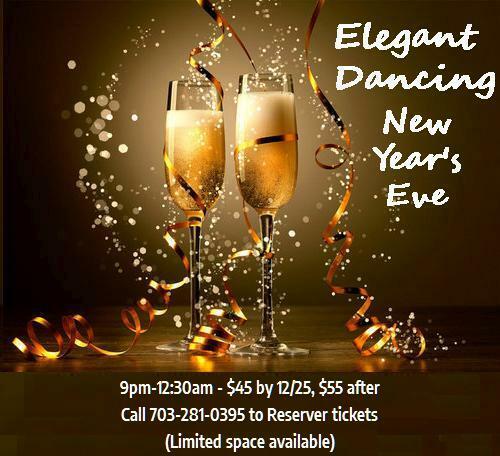 Be part of the best New Year's Eve Party in Northern Virginia. A guaranteed fun time with friends, great refreshments and a champagne toast. $60 by Dec 26; $75 by Dec 29 NO TICKET SALES AT DOOR! 10 PM until 4:00 AM or later! Delicious(!) finger food, wine, champagne, coffee, cookies and lots of fun. Make your reservations in advance(!) for a great night of Tango to welcome the New Year. at Clarion Inn Frederick Event Center, 5400 Holiday Drive, Frederick, Md. dance to Carlos Cacique Castera, Killer Joe, the Furious Force, i.e., DJ'S Mambo Soul and Dola. Other entertainers will be announced later. $100 bt December 28, $110 Dec 29 & 30 and Dec 31 $120/space available. Celebrate New Years in Style! party favors, and showcase routines! Watch the ball drop on the big screen! 9:00–`1:00am; $45 adv, before Dec 30 at 6pm, At the door: $55. Seating by reservation only. Dress to impress!! Dress to Impress - Elegant Attire. Hors d'oeuvres, social dancing, and the traditional toast at midnight. on Cheltenham across from Midas Muffler. Two floors of non-stop music in four distinct spaces, from big band classics to current dance hits, this night sells out every year. Peaches O'Dell and her Orchestra performing throughout the night on our Mainstage. world's greatest swing dance music - Hollywood's greatest hits, Latin goodies including rhumbas and tangos, hot-cha-cha from the late 1920s, dreamy romantic fare from the 1930s-40s, and a few humdingers of the 1950s. And because it's New Year's Eve, there will be more than a few surprises thrown in: chances to be a guest conductor, prizes for best red lipstick, slow dancing, and much more. To keep the music and dancing going all night, lounge act Tony Anthony and his Malvivants will provide entertainment between Peaches' sets. And on the Backstage, DJ Dredd serves up his trademark mix of pop, hip hop, soul, and dance classics. Fish Out Of Water is performing the main stage while DJ S-tyles spins the lounge. from the 80's to today and across the pop/rock/top 40 and Hip Hop genres. Party favors, full dinner buffet, four drink tickets & late night hoagie station. Cocktail Attire dress it up! Coat check $2 per item, cash only! Doors open 6:30pm for reserved seating for NYE Dinner, Dance and Show. Dinner and Performance from 7pm until 9pm. As NYE Events Tend to repeat, these 2017 Listings are displayed for convenient research. when selecting potential venue or where the Organizers neglect to update listings. For more than 20 years, the Black Cat New Year's Eve Ball has been the best night out of the year, consistently rated in the Top 10 New Years Eve events by The Washington Post. With two floors of non-stop music in four distinct spaces, from big band classics to current dance hits - all for $30 - it's no wonder this night sells out every year. Peaches ODell and Her Orchestra will be performing throughout the night on our Mainstage. Peaches' shows offer an intriguing mix of the world's greatest swing dance music - Hollywood's greatest hits, Latin goodies including rhumbas and tangos, hot-cha-cha from the late 1920s, dreamy romantic fare from the 1930s-40s, and a few humdingers of the 1950s. And because it's New Year's Eve, there will be more than a few surprises thrown in. To keep the music and dancing going all night, lounge act Tony Anthony and his Malvivants will provide entertainment between Peaches' sets. And on the Backstage, DJ Dredd serves up his trademark mix of pop, hip hop, soul, and dance classics. The Red Room Bar and Food For Thought Café will also be open. With no dress code, our NYE party lets you get as dressed up or as dressed down as you like, with a relaxed atmosphere that caters to all ages. Two floors of non-stop music, games, food, and fun for $30 make the Black Cat New Year's Eve Ball a classic - and one of the best deals in town. the traditional champagne toast at midnight. The event features a four course dinner, special hats, noise makers, horns, pop out streamers, and a champagne toast at midnight. The party starts at 9:00 pm, doors open at 7:00 pm. Tickets are $150pp. Theatre seats $75. 1 1/2 blocks from the Bethesda Metro station. The Cheltenham Parking Garage is located behind the Club. which is directly adjacent to the Club. 8 - 12 AM $15 at the door. NO TICKET SALES AT DOOR! All the Traditional Festivities ! At our New Year's Eve gala, we provide a mixture of themed party rooms reflecting a wide range of cultures. From Asia to Spain, America to Europe – there is something for everyone! Honolulu: Dance along with our Hula girls and learn to shake and limbo. Tokyo: Japanese Karaoke Room, where you are the star! Sing before your fellow revelers among artfully created Japanese origami. Amsterdam: Red Light District, where you can enjoy a hilarious late night "R" rated comedian to end your night. Mumbai: Hear what your future in 2018 will bring with our Palm and Tarot Readings and get a Henna tattoo! 6:30 PM- Party until 2am! 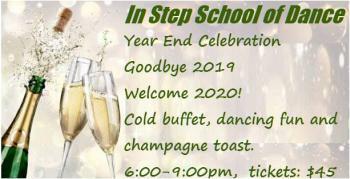 New Years Eve Benefit Dance at Clarion Inn Frederick Event Center, Frederick, Md. 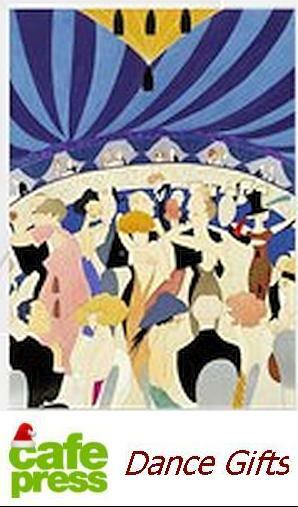 The Patty Pollatos Fund, Inc. 2017 New Years Eve Benefit Dance at the Clarion Inn Frederick Md. Entertainment by two bands: Kathie Martin & The Hot Rods (Rock & Roll, Soul), and Bonedaddy, Debbie Williams & the New Horizon Band (Classic Rock & Country Rock). $70.00 couple, $40.00 single. Tickets available by calling Sylvia 301-371-8641 or email sawings@aol.com. Ticket includes party favors and a heavy continental breakfast. The Clarion Inn, 5400 Holiday Drive, Frederick, Md. is offering discounted rooms. Call 301-694-7500 and use group name: Patty Pollatos Fund. The Patty Pollatos Fund, Inc. is an independent 501(c)(3) and community-based non-profit that operates with an all-volunteer workforce to raise funds and assist in raising funds for families during the temporary financial strain caused by illness - which knows no income level. 100% of proceeds go to PPF,Inc. prepared by Executive Chef Andrew Fontaine. array of gala party favors are included for a spectacular grand finale. VIP Upgrade option with All-area access, upgraded food and bar, additional exclusive entertainment, Chicago-style party hats and head bands, extra seating and more! Discount Hotel Rooms, Deluxe rooms include breakfast for two. Weekend package available at huge discount. Available ONLY through our website. Dress Code: Formal attire, Period costumes or attire. Includes Champagne Toast at Midnight! *10+ Internationally Themed Ballrooms of Dancing! 5pm-8pm Have an amazing NYE Dinner at the area’s top restaurants. 9pm-8am 8 Ballrooms of New Year’s Eve Bliss to 8am! Sarah Sullivan and the New Old Fashioneds in their jazz band form for the early, swanky portion of the evening and in the full bore party mode as they take us into 2018. Special musical interludes, DJs and, aerialists and burlesque dancers. Admission includes lots of great food, dancing, & more! Hotel rooms at $95/night plus tax, until December 17, 2017. Includes either a complimentary continental breakfast or a $5 discount the breakfast in the restaurant. Two Bands, Two DJ's spinning all genres of Music, Champagne Toast and more. Semi-Formal to Formal Attire is required. 6:30 - 8:00 International Standard Practice. (Not for Beginners). 8:00 - 9:00 Dinner (8 Course Chinese Meal). on the first floor of the Quality Window & Door Building. Turn left as you enter the main lobby to the glass door on the right. Join us for the best New Year's party in town! 9pm-1am. $45 in advance, $55 at the door. Includes showcase routines, heavy hors d'oeuvres, wine and champagne toast at midnight. Welcome 2018 with music and dancing at our Grand Foyer Party, one of D.C.'s most popular annual traditions! 10 to 12:30 am, bands Vintage#18 and Mark G. Meadows & The Movement,high-energy jazz, soul, R&B, and blues. Social photo booths to commemorate the night, as well a big balloon countdown to midnight. Champagne and other festive party drinks at the Grand Foyer bars. Admission is free with December 31 ticket for any of the performances or a dining receipt from our Roof Terrace Restaurant. 8:30 1:00am, Black tie welcome. Enjoy great music, dancing, hors d'oeuvres and the ball drop at midnight. Ticket includes party favors and champagne toast. It's the 1957 Senior Prom! Wear your high school prom finery. We'll have a vintage moon backdrop for photo ops, corsages and boutineers for the first 75 arrivals, party favors, and light refreshments. Ring in the New Year with us. line dances, Hats and noise makers, champagne & sparkling cider at midnight. Off Pickett Rd. between Rt 236 (Little River Turnpike) and Rt 50. - Reserved Seating -- This will be your primary seat for dinner. - Please indicate on ticket form which band/ballroom you prefer. You may dance throughout the evening in either room. Tickets include dinner, a reserved seat at a reserved table, party favors, champagne toast at midnight, a salsa lesson, dance to the music of Edwin Ortiz Y Sus Orquesta La Mafia Del Guaguanco, dance to the great salsa of four (4) of the areas best DJ'S, and be entertained by the dance performances. $150 December 31, 2017, if space is available. 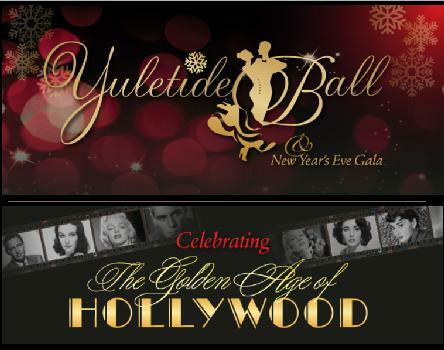 New Years Eve Celebration Gala with all the Bells and Whistles! to Potomac Plaza on right. End unit in parking lot. Dance into the New Year Ballroom and Latin with DJ's Giampiero Giannico & Ivan. Italian style buffet dinner in a beautifully decorated ballroom. Dancing continues til 2 am. tickets: Sylvia at 301-371-8641 or sawings@aol.com. Finger food, wine, champagne, snacks, fruits, cookies and coffee. then pay only half of the price for them! $10 - No lessons, JUST DANCING! !